I love to juice! It helps me to feel amazing and improves my energy level! Green juice helps me to consume a wide variety of produce in any given day. Juicing helps the body assimilate nutrients faster than eating vegetable on their own, plus you can juice more! 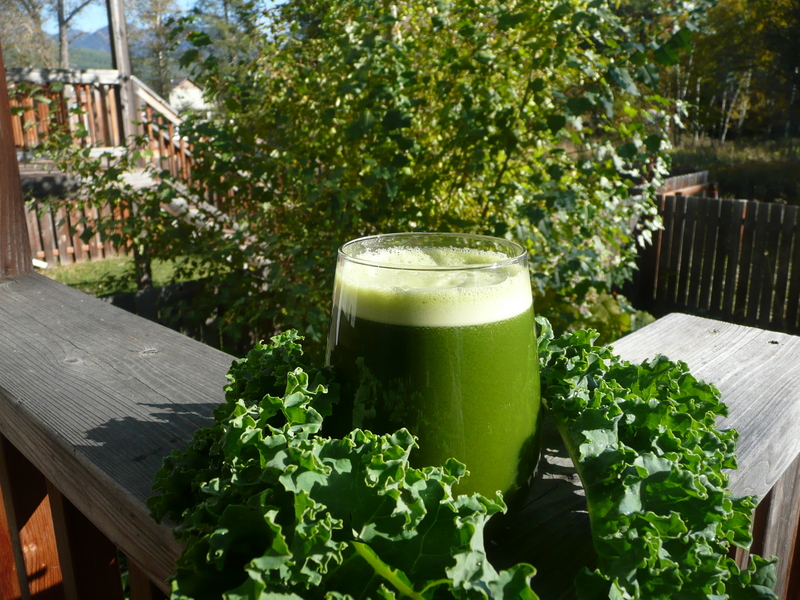 Green juice promotes the body to shift from an acid to an alkaline state. Our body needs a balanced pH to function properly, if we are either too acidic or alkaline our body goes through a series of adjustments to try to neutralize the imbalance. Juicing helps me to maintain balance, youthful, more radiant skin as well as helps me maintain a stable weight because I am getting the nutrients I need without overeating. I have had a lot of people lately comment on how they love my juices. How do I get them to taste so good? Many people either put too much dark pungent greens in their juices thinking that more is better or they either start using too much fruit because they are addicted to sugar. Its all about balance, use different greens a little sweetener. A good balance to a good green juice and its usually includes a delicious base like celery or cucumber. From there I like to include kale, chard, romaine, spinach, parsley, cilantro, mint, the list goes on depending on what is in my fridge. To sweeten the juice, I like to add a couple of apples or some pineapple or even some grapefruit. If I want my juice to be a little more zesty, I might add some ginger or lemon or lime. Experiment, have fun and don’t forget to taste as you go! You can do it! As you can see, I like celery but this can easily be interchanged with cucumber or whatever other greens you have on hand. Celery: Is an amazing relief for all inflammation including rheumatoid arthritis, osteoarthritis, gout, asthma and bronchitis. Celery helps fight cancer, lowers blood pressure & cholesterol, aids in digestion, elimination & weight loss, helps with insomnia, and it is also beneficial to help those with a weak sexual drive. Juice is the most efficient and nutritious way to eat celery, and people who have these conditions can drink as much juice as desired without overdosing. Cucumber: Do you remember putting cucumber slices over your eyes to reduce morning puffiness (or seeing women do it in movies)? Well, imagine cucumber doing the same thing for your gut. It contains vitamin C and caffeic acid, both of which may help reduce inflammation and swelling. Kale: Amazing superfood to include in your diet, whether you are juicing or not. Kale is an incredibly effective anti-inflammatory food and since inflammation is the number one cause of arthritis, heart disease and a number of autoimmune diseases, kale is the perfect leafy green to add to your juices or salads for that matter. It is also a good source of essential omegas 3 & 6, helping not only to get protein into our body but to boost our immune system as well. Chard: Recent research has shown that chard leaves contain at least 13 different polyphenol antioxidants, including kaempferol, the cardioprotective flavonoid that’s also found in broccoli, kale, strawberries, and other foods. Now what does this mean? I means that chard has unique benefits for blood sugar regulation for people with diabetes, it has powerful antioxidants as well as anti-inflammatory benefits and supports bone health! Who needs a glass of milk when you can just add chard to your green juice? Cilantro: This herb isn’t just a commonly used leaf or seed, used in exotic recipes, its a powerful cleansing agent! Cilantro helps remove heavy metals and other toxic agents from the body. It works to cleanse the liver and is a powerful anti-inflammatory that may help relieve symptoms of arthritis as well as wards off urinary tract infections and is helpful in fighting anemia. It is anti microbial and anti fungal. Helps with insulin secretion and lowers blood sugar. Contains immune boosting properties, helps ease conjunctivitis, as well as eye-aging, macular degeneration, and other stressors on the eyes. Cilantro is so amazing it helps as an overall digestive aid and helps reduce feelings of nausea. It helps ease hormonal mood swings associated with menstruation and reduces menstrual cramping. What’s not to love about this amazing herb? Parsley: The inclusion of fresh herbs in your diet can be especially beneficial, as many of them are strong antioxidants. Parsley contains beta-carotene, vitamin C, and a number of phytochemicals with antioxidant properties. It also tastes great in carrot juice! Apples: You know the saying, “an apple a day keeps the doctor away?” While that may be an exaggeration, apples are a miracle fruit in my mind. Studies have linked the consumption of apples to a reduced risk of a variety of cancers, cardiovascular disease, asthma, and Type II diabetes. They are strong antioxidants, and contain a number of phytochemicals, including quercetin, which is anti-inflammatory. Pineapple: Packed with the enzyme bromelain which plays a major role in the body’s healing process. Bromelain is a natural potent anti-inflammatory that has many health benefits and encourages healing. According to recent researches, bromelain is very effective in treating bruises, sprains and strains by reducing swelling, tenderness and pain. This powerful anti-inflammatory effect can also help relieve rheumatoid arthritis symptoms and reduce postoperative swelling. Grapefruit: I love grapefruit. I crave Grapefruit. If you are serious about wanting to improve your health, grapefruits are one of many live foods you should consider adding to your regular diet. It helps cleanse the kidneys, digestive and urinary systems, detoxify the liver, ease chronic liver conditions and help to eliminate toxins from the body. It may also help dissolve gallstones, lower cholesterol, aid in weight loss, helps fight cancer & is awesome in fighting candida and parasites in the body. Its anti-inflammatory properties are helpful with chest congestion, rheumatoid arthritis, lupus and other inflammatory disorders like osteoarthritis. Lemons: When life gives you lemons, make lemonade! Lemons are anti-inflammatory and great for detoxification because they have high levels of vitamin C, which can bind to heavy metals and neutralize the toxins in our body. Lemons also stimulate the liver to make glutathione, a special enzyme used by the liver in detoxification. Ginger: Ginger ale is historically the tonic of choice for stomach unrest. However, with all the high fructose corn syrup or sugar in ginger ale, your best bet is making your own tea or including a chunk of fresh ginger in your juice. In addition, ginger is known to alleviate migraine symptoms, and my own experience with ginger juice has proven that to be true. Whenever I feel a headache coming on, I make a ginger juice – the worse the headache, the more ginger I add. If you’ve never used ginger in your juice, it can taste pretty strong, so start with a 1-inch chunk and increase the amount over time. Now go on and get juicing! What is your favorite juice? Please share your recipe! It goes with your everywhere you go. It is on display at work and at home. People around you are affected by it. It has no shape, color, or size, yet its impact on your life is profound. What is it? Your attitude! Beet juice is amazing! Its often referred to as natures viagra because it increases blood flow through the small capillaries, and because erectile dysfunction is often caused by poor circulation.... well you get the picture. Beet juice will improve your performance in the gym. This is because this magical juice dilates blood vessels to improve blood flow and lower blood pressure, as well as reducing the amount of oxygen needed by the muscles during physical activity. Researchers from the Sport and Health Sciences department of UofE found that people who drank beetroot juice required 12 percent less effort to perform even low intensity exercise like walking than those who did not drink beet juice. How is beet juice a stomach acid tester? Well, if you eat or juice a lot of beets, and your urine turns pink, this is called beeturia and it is caused by low stomach acid. It means that your body is not metabolizing and assimilating nutrients properly. Juice more beets now! Beets are an amazing tonic for your liver! Beet juice helps stimulate liver cells to cleanse and protect bile ducts. It also helps relieve the kidneys of stress and lets face it we can all use a little less stress in our lives. If you want a great boost in energy, your answer is simple. Drink beet juice! It does a body good!